Thanks again for all your help so far in classifying radio galaxies through RGZ. We’re rapidly approaching our 1 millionth classification, probably by the end of this week (Jan 15-17) at the current rate. Don’t forget that we’ll be awarding prizes! In the meantime, we’re excited to announce that we’ve just finished processing a new set of images for RGZ. There are 2,461 new images in total: the radio images are from a survey named ATLAS, carried out by the ATCA telescope in Australia. 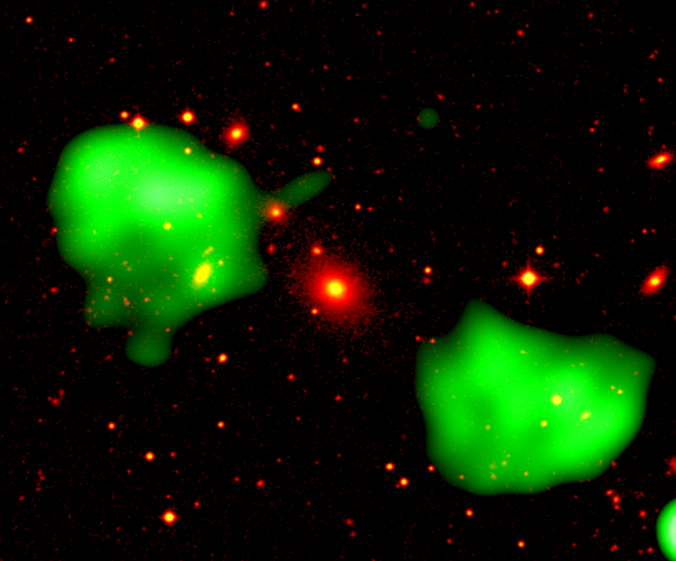 The corresponding infrared images come from the Spitzer Space Telescope as part of a survey named SWIRE. Due to the differences in telescopes (ATCA has fewer dishes and a different arrangement of them than the VLA, while Spitzer has a much bigger mirror than WISE) and the depths of the two surveys, the data will look a little bit different. If you’ve done lots of classifications on Radio Galaxy Zoo already, you may notice more elongated radio beams in the ATLAS data, as well as a slightly larger size of the smaller unresolved noise spots. ATLAS can also detect fainter objects than the FIRST survey. The new SWIRE infrared images have about twice the angular resolution of WISE (it can separate objects down to 3 arcseconds apart) and are more than 20 times as sensitive. That means you’ll likely see more infrared objects in the new images, and might have more choices for likely host galaxies for radio emission. An example of one of the new ATLAS/SWIRE images for Radio Galaxy Zoo, as seen in Talk. From left to right: radio contours, infrared overlaid with radio, infrared only. Since the images are mostly similar, the task for RGZ hasn’t changed (in fact, the original tutorial image was from ATLAS data). We’re still asking you to pick out individual radio components (or groups of components) and match them to their IR host galaxies. The new images will be randomly mixed in with the older images; you should see an ATLAS image every 6th or 7th classification, on average. If you’re curious whether a galaxy you’ve just classified is in ATLAS, the easiest way is to look at it in Talk: the new galaxy names will begin with a “C” (eg, “CI3180”) and will have declinations that are negative (eg, -27.782) showing that they’re in the Southern Hemisphere. We’ll post a longer blog post very shortly with more information on ATLAS, SWIRE, and what we’re hoping to learn from these new images. In the meantime, please post here or on Talk if you have any questions! And keep up the classifications in the next few days — hopefully you can be our 1 millionth image! 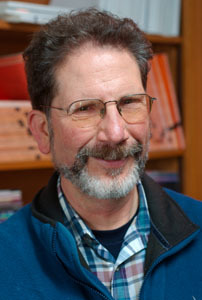 Meet Larry Rudnick, Project Advisor for Radio Galaxy Zoo. Larry is often seen chatting to volunteers on RGZ Talk; now he’s written a bit more of an introduction. I’m a Distinguished Teaching Professor of Astrophysics at the University of Minnesota. But before I was distinguished, I grew up in Philadelphia, where I decided in 6th grade that I would go into science while I was helping my grandfather pour molten lead into molds to make fishing sinkers. My bachelor’s and PhD degrees are in physics, but astrophysics was what really kept me up thinkng at night. I’ve worked mostly in the radio part of the spectrum, using telescopes all over the world, plus some work in X-rays and infrared. I’ve studied radio galaxies, since the late 70s when Frazer Owen and I introduced a classification system for tailed radio galaxies. Identifications were pretty painful then, taking about an hour each to get the radio and optical photographs lined up. We’ve come a long way! My students and I also spent some years studying the radiation from the supernova remnant Cassiopeia A and others, producing the first 3D image of an explosion. Today, my work focuses on clusters of galaxies and their connections with large scale structure. The most interesting course I teach is one called “Nothing” where we explore everything from the vacuum, to the number zero, to blind people seeing nothing, to placebos, to King Lear. I’ve done a lot of K-12 work, training teachers in using hands-on science activities, and do a lot of public education, through lectures, radio and TV interviews, and working with our local Planetarium. Radio Galaxy Zoo is my first citizen science project, and I’m really looking forward to how much we’re going to learn. This is the second half of a description of radio galaxies from Anna Kapinska, Radio Galaxy Zoo science team member. Last time we discussed the early and mid stages of radio galaxy life that take up the majority of the radio galaxy lifetime. Today we will go much further following paths of aging radio galaxies. As we discussed last time, radio galaxies are typically between tens and hundreds of kilo- parsecs in size (30 thousands – 3 million light-years). However, some of our buddies will grow to enormous sizes. Once a radio galaxy reaches one Mega-parsec in size (3.3 million light-years across) it’s called a giant – that is, a giant radio galaxy. Not every radio galaxy will reach such enormous sizes; only the most powerful ones whose environments are not extremely dense do. We don’t see too many giant radio galaxies. There are two main problems. One is that they are of low radio luminosity, and so our telescopes are not always sensitive enough to detect more than a subset of radio galaxies reaching this stage of their lives. The other problem is that giants are often composed of numerous bright knots spread over a large area and it’s difficult for us to tell which of these knots are associated with the giant and which are from unrelated sources. Figure 5: 3C 236, the second largest giant radio galaxy, extends nearly 15 million light- years across. It is located at a redshift z = 1.0 and has angular dimensions of over 40 arc-minutes in radio images. Credits: NVSS, WRST, Mack et al. 1996. Giant radio galaxies are usually hundred of thousands, or more, years old and they are very large and extended. They can tell us a lot about what is going on within the space in between galaxies in groups and clusters, and that’s why radio astronomers cherish these giants! The largest giant radio galaxy known is 4.5 Mega-parsecs across (named J1420-0545), which is almost 15 million light-years! In radio images these radio galaxies extended over 20 or 30 arc-minutes, which means you will normally see only one of their lobes at a time in any of the Radio Galaxy Zoo images we classify. This is also the reason why we would tag these Radio Galaxy Zoo images as #overedge or #giants. But radio galaxies will not grow to infinity, they will eventually die. What happens then is that the radio galaxy starts fading away. Physically, at this point, the supermassive black hole stops providing jets with fresh particles, which means the jets and lobes or radio galaxy are not fed with new material. The electrons in the radio galaxy lobes have a finite amount of energy they can release as light, and so the lobes simply fade away until they are no longer visible with our telescopes. Dying radio galaxies become progressively less powerful, and less pronounced: no bright jet knots nor hotspots are present within the lobes anymore (see Figure 6). Eventually we can’t see these radio galaxies any more with our telescopes. You would typically mark these radio sources as #relics or #extended in Radio Galaxy Zoo images. It takes only ten thousand years for the brightest features of radio galaxy lobes to disappear, which is barely 0.01% of the total lifespan of radio galaxy. Again, just as the birth, it’s a blink of an eye! Well… not really! Astronomers have seen evidence that radio galaxies re-start. What does that mean? That means radio galaxies sort of resurrect. After switching off, the supermassive black hole is radio silent for a while, but it can become active again; that is the whole cycle of radio galaxy life can start all over again. A single host galaxy can have multiple radio galaxy events. We still don’t know the ratio of how long the galaxy is in quiet, silent stage, to how long is in its active, violent radio galaxy forming stage. We also do not know if all galaxies go through the active, radio galaxy forming stage, or whether it’s just some of them. And we don’t know what exactly is the process that makes the galaxies switch on and off. But details on that… that’s yet another story! Figure 7: Re-started radio galaxy, PKS B1545-321. This radio galaxy has the so-called double-double structure, which consists of two pairs of double lobes. The outer pair of lobes are older and they are slowly fading away. The inner pair of lobes are created after the radio galaxy is born again. This radio galaxy is also a giant, the outer lobes extend to one Mega-parsec (3 million light-years). Credits: Safouris et al 2002. 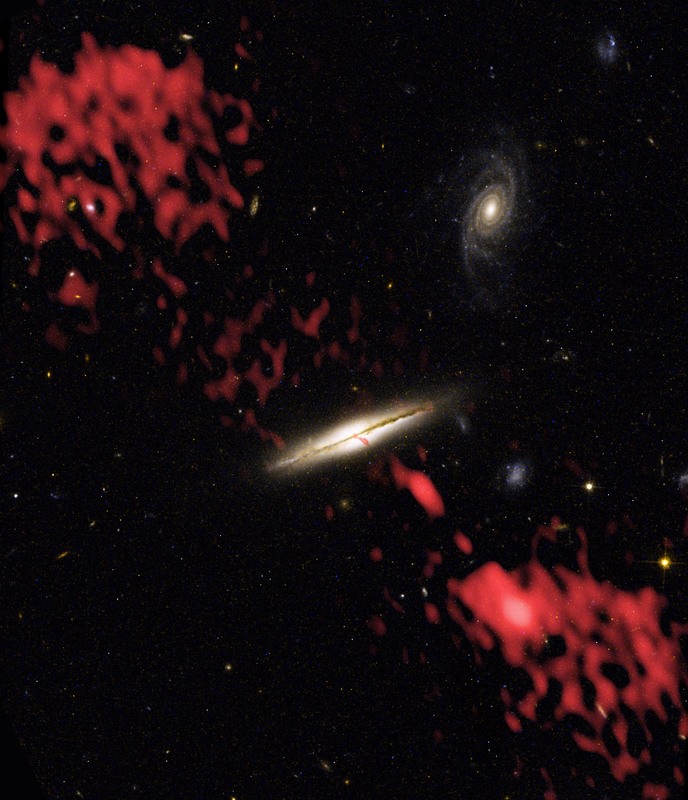 Today’s blog post is written by Radio Galaxy Zoo science team member Anna Kapinska, who works on radio jets and studies how they affect the galaxies which host them at various stages of the Universe’s evolution. This is the first of a two-part series. As most of you know by now (after classifying hundreds of radio and infrared images in our amazing Radio Galaxy Zoo!) radio galaxies are not the type of object that most of us are used to. There’s no stars and dust; no light from that. It’s all about the jets – outflows of particles ejected from the vicinity of the galaxy’s monstrous supermassive black hole and moving nearly at the speed of light. Some of these particles, electrons, emit light while spiralling in the black hole magnetic field. By no means are the radio galaxies stationary or boring! Figure 1: The famous Hercules A radio galaxy. The radio emission is imaged in pink and is superimposed on optical image (black/white) of the field. You can clearly see the jets extending from the central host galaxy to feed the lobes. Credits: VLA. Radio galaxies can live for as long as a few hundred thousand or even a few million years. They grow and mature over that time, and so they change. They even don’t disappear straight after they die; that takes time too. So, how does the life of a radio galaxy look like? Just as for ourselves, humans, we have names for different stages of radio galaxy life. There are newborn and young radio galaxies. There are adults – these are the most often encountered individua. There are also old, large giants. And there are dead radio galaxies – the slowly fading away breaths of magnificent lives – a rare encounter as they don’t stay with us for too long. So, how do these radio galaxies look like and what exactly happens during their lives? Over the next two blogs I will take you through the evolutionary stages of radio galaxies. Let’s start off with a simple plot astronomers like to use for an overview of a radio galaxy evolution during its lifetime. 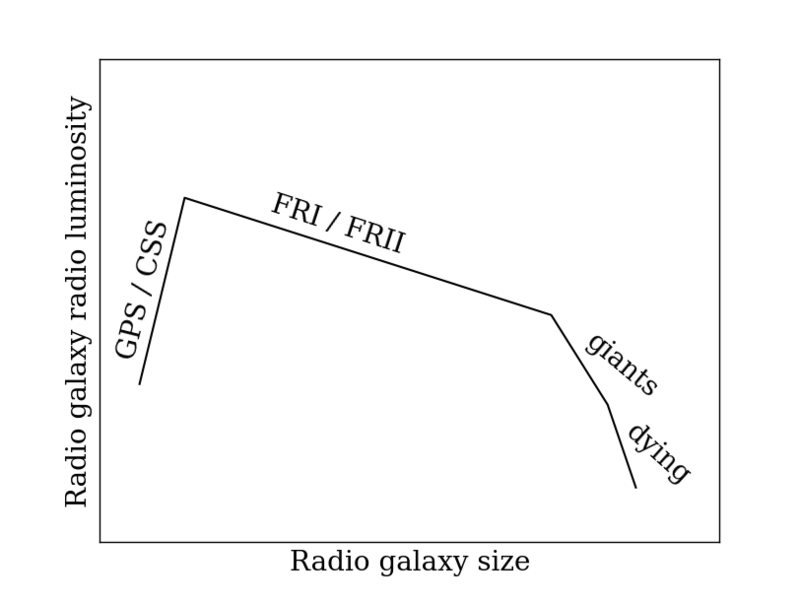 The plot describes how the radio luminosity changes with the radio galaxy size (Figure 2). The larger the radio galaxy, the older it is (usually), so we can trace the changes in radio galaxy luminosity and structure (size) as it gets older. Figure 2: A schematic view of different stages of a radio galaxy life. Credit: Kapinska. After a radio galaxy is born it will be growing up very quickly – in a blink of an eye its jets will be penetrating dense environments out to the borders of the host galaxy (the one you can see in optical and infrared wavelengths). Astronomers call these sources GPS (Gigahertz peaked sources) and CSS (compact steep spectrum) radio sources. The GPS/CSS sources are very small; they reach only kilo-parsec distances from the central black hole (3.5 thousand light years), which is merely few arc seconds, or even less, in radio images. This is the reason why we usually detect them as compact radio sources; however, one can sometimes see their double radio structure (that is the jets) in very high resolution radio images (Figure 3), hence really they are just mini-doubles! Figure 3: A typical CSS radio source, 3C 237, as seen with the FIRST survey (left) and with 20 times higher resolution VLA observations (right). This small radio galaxy lies at a redshift z = 0.877 and is only 9 kilo-parsecs (30 thousand light years) in size. Credits: FIRST, Akujor & Garrington 1995. This stage of radio galaxy life is the only one at which the radio galaxy luminosity rises steeply as the source grows in size. The stage lasts only for tens to hundreds of thousands of years, which is barely 0.1% of the radio galaxy’s lifetime. This means there is a very short window of time when we can spot CSS and GPS sources, but there are many of these sources around and they are also very bright (their radio luminosities are typically the maximum a radio galaxy can reach) so we often detect them. After the childhood radio galaxies enter the adulthood. Astronomers have dozen of names to describe the adult radio galaxies and this depends on their structure observed in radio waves, but really, what these radio galaxies have in common is their age and size. They are usually tens to hundreds of millions of years old, and between tens and hundreds of kilo-parsecs in size (30 thousands – 3 million light-years). The luminosity of these radio galaxies slowly drops as they penetrate through the intergalactic space. When you inspect the Radio Galaxy Zoo images, these radio sources are the #hourglass, #doublelobe and #plumes. 3C 237 and Centaurus A are fantastic examples of what we usually see! (Figure 4). 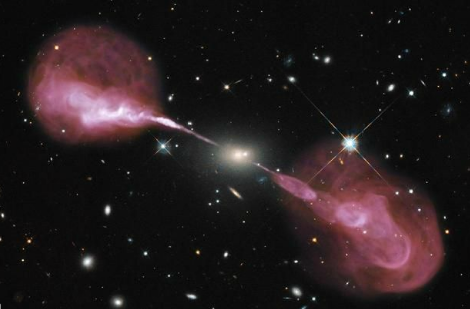 You will quickly notice that there are two main types of these radio galaxies; one type that has very strong radio emission at the end of the lobes (#hourglass, #doublelobes) which is the signature of jets pushing through the ambient medium around radio galaxy. These radio galaxies are called FR IIs by radio astronomers, and the bright spots at the ends of the lobes are called hotspots. 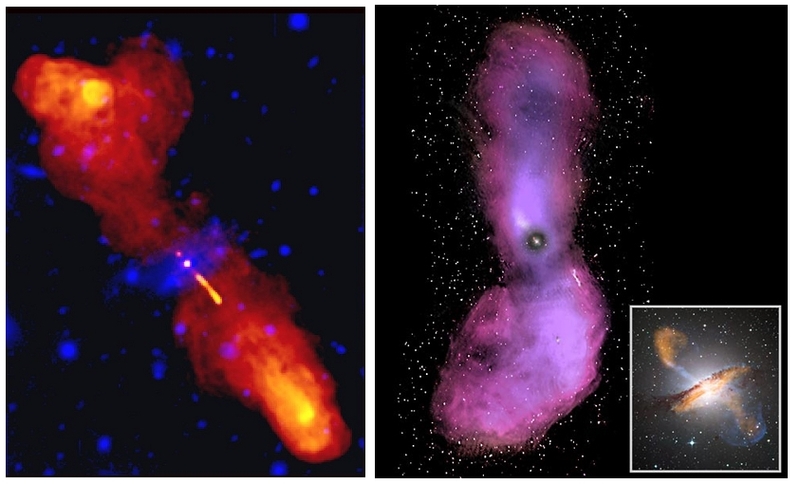 The second type has their maximum radio luminosity close to the supermassive black hole or half way through the lobes; these are #plumes within the Radio Zoo and are tagged FRIs by radio astronomers. Plumes are less powerful than the hourglass, but they are even more of a challenge to astronomers! The radio galaxy adult stage will be the majority of their lifetime, and that’s why they are the radio galaxies and radio structures one would typically see. Next time we will see what happens when the radio galaxy gets old! I grew up in northern Germany and developed in interest in astronomy only when I finished school. I went to Bonn to study Physics and Astronomy and, after my PhD, moved to Sydney to work as a postdoc. Here’s where I got involved with radio surveys of large portions of the sky, and also where I got involved in radio interferometric observations of large fields with continent-sized baselines (Very Long Baseline Interferometry). After moving back to Bochum, Germany, I got involved with the Radio Galaxy Zoo project, mainly because I just loved the idea and because I was able to quickly contribute to the project by making the images. Also, for a paper a few years back I had classified more than one thousand radio/IR sources the way RGZ users do it now – and I had to do it three times! So I know what it’s like, and I have seen my fair share of radio/IR images in my life. In general I like to fiddle with computers, software, and technology, so every project which requires crunching through, or trying to filter things out of piles of data is interesting. I was born and grew up in Poland, where I also did my undergrad studies in astronomy. Since then astronomy was the force behind my life paths directing me via the Netherlads and the UK to Western Australia where I currently work as a Research Associate. I was introduced to radio astronomy during my masters studies when I learned all the fundamentals, and the tricky bits too, about radio interferometry. After that I moved towards more theoretical understanding of how radio galaxies grow and how they influence our evolving Universe. For that we still need large samples of radio galaxies of various sizes, shapes and luminosities – and here is where the Radio Galaxy Zoo and all your citizen science work is so invaluable! 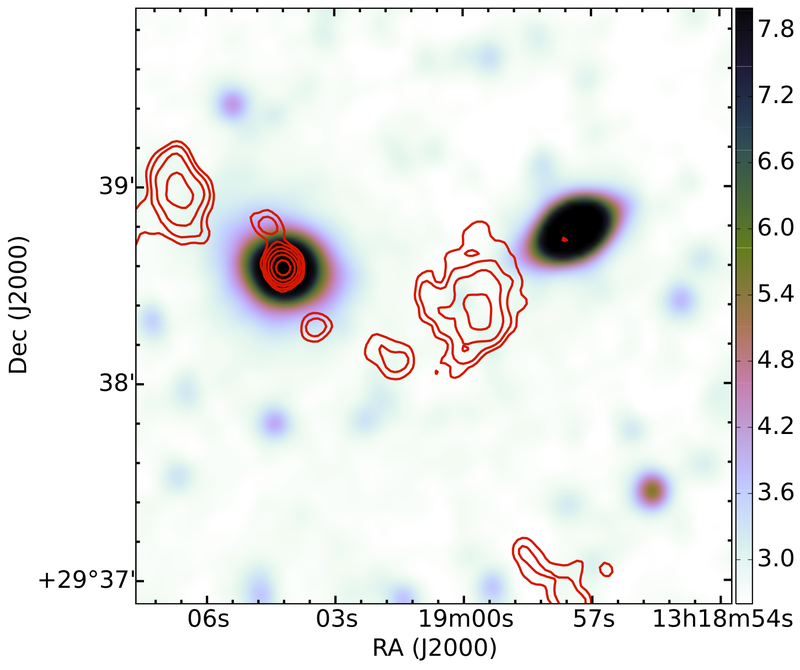 Currently, I am also strongly involved in producing sky surveys with two fanstastic new radio telescopes, Lofar and MWA – hopefully we will be able to include these radio sky images in Radio Galaxy Zoo at some point too! IFRS: The first supermassive black holes? 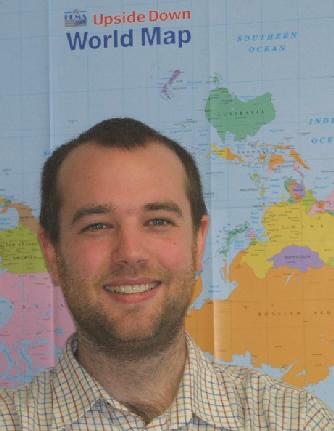 Today’s Radio Galaxy Zoo post is by Ray Norris, our Project Advisor. Ray researches how galaxies formed and evolved after the Big Bang, using radio, infrared, and optical telescopes. In Radio Galaxy Zoo, some bright radio sources don’t have any infrared sources at all associated with them, and they have been given the hashtag #ifrs, for Infrared-Faint Radio Sources. So what are these IFRS? In 2006, we discovered about 1000 radio sources in the Australia Telescope Large Area Survey (ATLAS). Conventional wisdom told us that all of these would be visible in the infrared observations taken by the Spitzer Space Telescope, as part of the SWIRE project. So we were astonished to find that about 50 of our sources were not listed in the SWIRE catalog. Could they be bugs in our data? After eliminating iffy sources, we were left with 11 sources that are bright in the radio but invisible in the infrared images. We dubbed these objects Infrared-Faint Radio Source (IFRS). With hindsight, we should have thought of a better name for them. But at the time we didn’t know that they would turn out to be important! 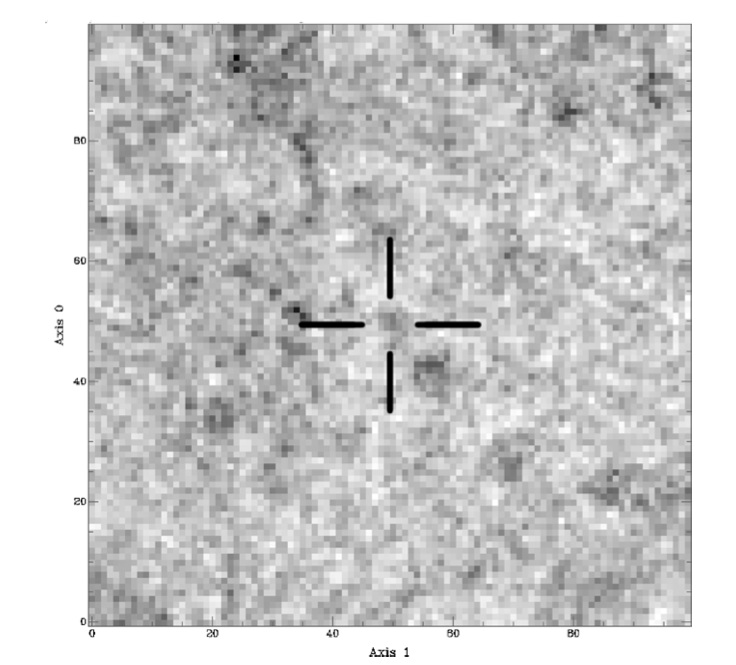 A very deep infrared image (from this paper), made by stacking images from the Spitzer Space Telescope at the positions of IFRS (shown by the cross-hairs). This image, about 300 times deeper than the WISE images currently being used in Radio Galaxy Zoo, shows that not only is there no infrared counterpart at WISE levels, but even if you go enormously deeper, there’s still almost nothing there in the infrared. 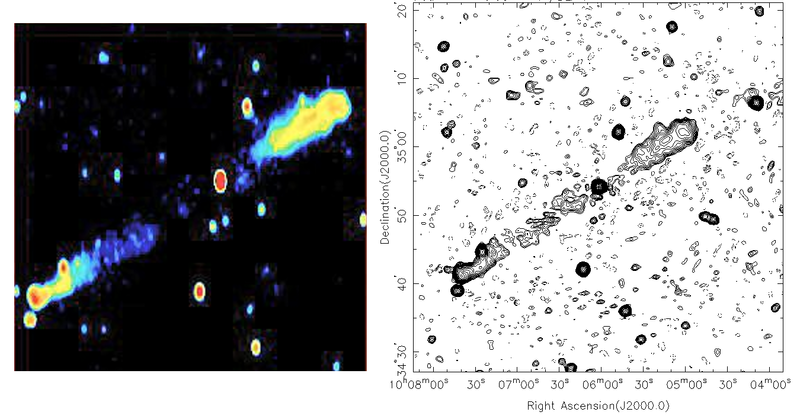 We suggested in 2006 that these might be high-redshift active galaxies – galaxies whose emission is dominated by a super-massive black hole at their centre (the galaxies you are looking at in Radio Galaxy Zoo). This was surprising, because we were finding so many of them that it meant there must be far more supermassive black holes in the early Universe than found by deep optical surveys, such as SDSS (whose images we use in Galaxy Zoo). It’s also far more than can be accounted for by conventional hierarchical models of super-massive black hole formation. Naturally, our colleagues were sceptical, and most of us harboured our private doubts too. But over the next few years we tested this idea and its alternatives. Gradually our confidence grew that these were indeed high-redshift active galaxies. 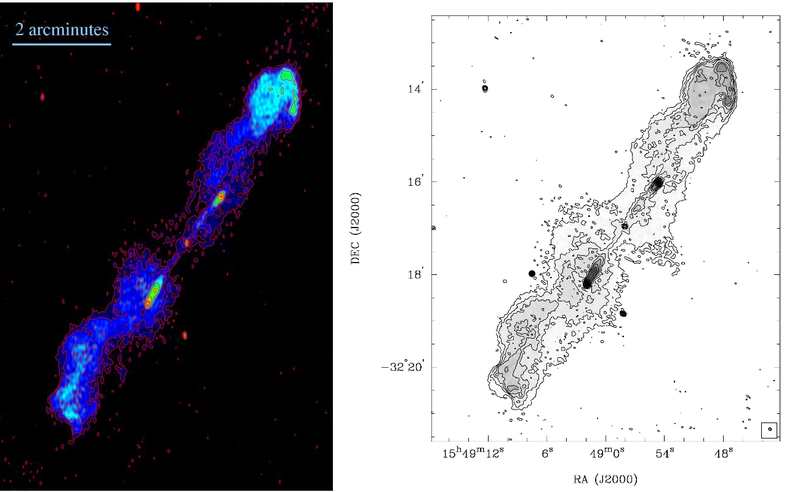 In 2011 we showed that they were similar to high-redshift radio galaxies (HzRG) but even more extreme. Crucially, we suggested that they follow the same correlations between the radio and infrared emission as the HzRG. If this suggestion turned out to be correct, then that would push them to be amongst the first supermassive black holes in the Universe. Fortunately, it was possible to test this hypothesis by measuring the redshifts of less extreme objects, to see if they followed these same correlations. Two new papers confirm that they do indeed follow this correlation. In one, Andreas Herzog and his colleagues use the European Very Large Telescope to measure the redshifts of three of these less extreme objects, and find they lie on the correlation, at redshifts between 2 and 3, just as predicted. In the other paper Jordan Collier and his colleagues take exactly the same data now being shown in Radio Galaxy Zoo, and search for objects which are relatively much brighter in the FIRST (radio) data than in the WISE (infrared) data. 1,317 of these are found, of which 19 have measured redshifts. Again, all but one of these lie in the redshift range 2 to 3. This is strong support for the hypothesis! Armed with this, we are increasingly confident that the most extreme IFRSs that will turn up in the fainter ATLAS and COSMOS field, to be released in Radio Galaxy Zoo in a few weeks, will include many supermassive black holes formed in the first half-billion years after the Big Bang. According to conventional hierarchical black hole formation models, these shouldn’t exist. So the race will be on to identify them and measure their redshifts using instruments like ALMA. 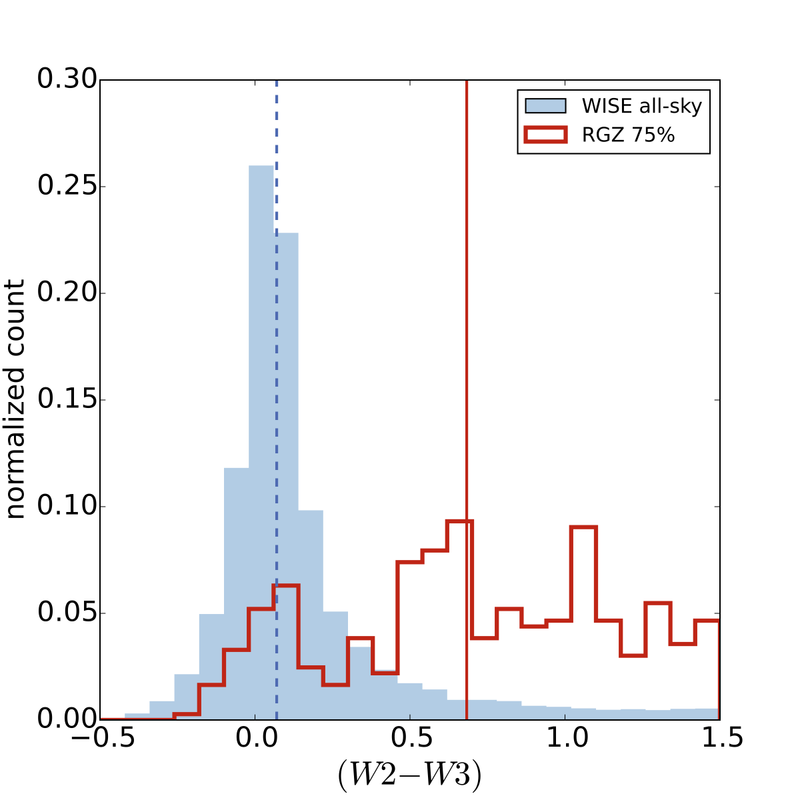 Not everything in Radio Galaxy Zoo classified as being an IFRS will turn out to be a high-redshift black hole, as the data currently being displayed (FIRST and WISE) are not deep enough to pick out the really high-redshift objects. But when the new ATLAS data are loaded into RGZ in a few weeks, almost every object that appears in the radio but not in the infrared will be one of these enigmatic objects. We can’t wait to see how many you find! Ivy is an Australian astronomer (currently based at CSIRO) who is interested in the how/why galaxies start and stop forming stars. She is currently obsessed with galaxies that have suddenly stopped forming stars (aka ‘post-starburst’ galaxies), blue spheroidal galaxies and galaxy interactions in general. Having worked with the original Galaxy Zoo project, she became super excited with the prospect of helping to launch Radio Galaxy Zoo. She is very keen to find out how the massive radio jets emitting from central supermassive black holes affect its host galaxy as well as neighbouring galaxies. When not working for astronomy, she is slave to two feline overlords, Princess Pippa and Master Finian. These two can pass for the internet celebrities: Grumpy Cat and Chemistry Cat (although Finian does not approve of glasses and bowties). 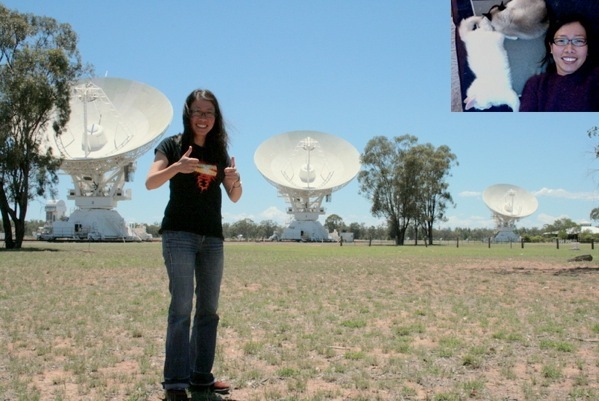 In the week preceding the launch of Radio Galaxy Zoo, Ivy was the Duty Astronomer at the Australia Telescope Compact Array (ATCA, CSIRO)—where some of the radio images for Radio Galaxy Zoo originated. Inset: Ivy with her other overlords.